Along with fondue savoyarde and raclette, Tartiflette is the most typical and authentic food you can get in the French Alps. This is exactly what you need after a big day of hiking or mountain biking in the summer or skiing during the winter. A proper warmer and full-on comfort food. Forget about the calories… this one is a monster! But you deserve it after such a massive day 😉 Or if you’ve not been energetic just enjoy it for the delicious treat it is. Tartiflette showcases one of the things the French Alps are very good at food-wise: cheese! The beauty of this dish is that it’s very easy to make, and preparation time is quick too. It’s not overly cheap as the key ingredient – reblochon cheese – is on the dear side in the UK sadly. It’s better to cook this dish the day before as the potatoes will soak up the strong flavours and taste even better reheated. Cut potatoes, onions and bacon. Add them all to your dish, mix them up with your hands. Cover with sliced reblochon cheese. Cook in the oven for 1 hour at 210ºC. Put your oven on at full whack. Get all your ingredients ready. First, the potatoes... You don't need to peel them as most of the nutrients are in the skin but you will need to wash them thoroughly. Either soak them for a few minutes in cold water and then rinse them quickly with running water. Or scrub them under running water with a washing-up brush. Also don't forget to remove all the gnarly bits. Then you can cut them into 2cm cubes. Keep in mind that the smaller they are the quicker they cook. When you are done put them into a big roasting tray or pyrex dish (don't worry about arranging them nicely as you'll be mixing it all up later). Now for the onions... you just need to peel them, chop them and add them to the potatoes. It is now time to add the double cream on top of everything as evenly as possible. But don't worry too much... it will spread even more when it's cooking. Season with some pepper but NO SALT. The smoked bacon and the reblochon cheese are already quite salty. Finally slice your reblochon cheese into 1/2cm thick slices and lay them down on top of everything else, try to cover the whole surface area. And now you can put the whole dish in the oven at 210ºC for an hour until crispy and gratinéed! The reblochon cheese is much easier to cut when it's just out of the fridge as it's harder. So it won't stick to your knife as much. 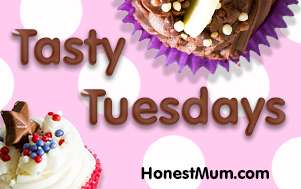 Popping over from #tastytuesdays 🙂 …I love winter warmers, and always great to find a ‘new idea’ recipe (totally new for me at least)! Beautiful blog name & lovely concept, I’ll be back to check out more. I’m a huge winter warmer lover too, nothing like cheesy carbs on a cold, winter’s night 🙂 glad you like it, enjoy! Thanks for popping by, glad you like the name and concept as the blog is brand new! Oh my God that looks awesome saucesome! I am going to try this with my family (although I’ll need to replace it with veggies rather than bacon as I’m vegetarian). And it sounds so tasty. It is sooooo good! There is a vegetarian alternative, called Pela, which is exactly the same just without the bacon, and is still delicious. This sounds delcious although I suspect I may struggle to find the cheese….I have pinned it as one to try, the combination of cheese, cream and bacon are all good tucker for Boy who has CF (and I am sure will be very morish for the rest of the family too). #TastyTuesday. It is so delicious, I can’t recommend it enough! You can usually find the cheese in Waitrose, Sainsbury’s and Ocado (we’ve got it from all of these places pretty easily), I hope you manage to find it ok. Enjoy! It really is amazing – if you love cheese then it’s a must! This looks really delicious and I love a bit of comfort food. I love Raclette, so this would definitely be something I’d enjoy. I live in Amsterdam so not sure if I could find the cheese, but I would definitely want to try making something like this. Great recipe. Coming over from #TastyTuesdays. Looks like a great wintery dinner! Yum! This meal went down a storm with Dad. I know we’ve eaten this loads of times with you but so pleased to have done it myself. The recipe was easy to follow on my phone and I was pleased to be able to get the Reblochon at Waitrose. Well done keep up the good work. Glad you’re enjoying the blog, hope your valentine’s night goes well 😉 So jealous of all the ski eating you’ll be doing soon…. Cooked this last night and it was delicious! Reduced the cooking time to 50mins as my oven is fierce and even so the cheese was a bit over cooked around the edges, but it didn’t spoil the flavour. It tasted very authentic and was thorough enjoyed by husband and mother in law. Real comfort food for these miserable evenings. This is a firm favourite in our Franco-British-Aussie household. I’m almost sad winter’s coming to an end as you really can’t eat tartiflette in summer!!! (But only “almost”)! I’m obsessed with it, and eat it all year round…..well you can in the UK! I’ve got to make a tartiflette tonight for a friend and realised that I forgot to mention that the reblochon cheese is much easier to cut when it’s just out of the fridge. It will be harder and won’t stick to your knife as much.